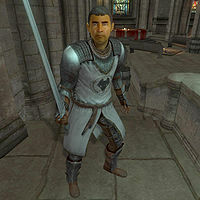 Berich Inian is an Imperial warrior, and a member of the Kvatch Castle Guard. He can be found in the Chapel of Akatosh in Kvatch with the other refugees from the Siege of Kvatch. He holds the key to the Kvatch Castle gatehouse and will prove most helpful during the Battle for Castle Kvatch. He is equipped with a Kvatch cuirass and iron greaves, gauntlets and boots. He is armed with a steel longsword and carries the guard house key and a small amount of gold. You will encounter Berich for the first time when you enter the Chapel of Akatosh which is surrounded by Daedra, preventing him and Tierra from rescuing the civilians; when approached, the seemingly frustrated guard will ask: "How did you get in here? What are you doing here?" Two replies are available to you. If you tell about him about your search for Martin he will say: "Martin? He's back there, looking after the other survivors." If you choose an ill-timed heroic approach, stating that you are here to save him, he will stick to his orders: "I don't know how you got in here, but you're not saving anyone! No one leaves this Chapel until the Captain gives the all-clear. I have my orders." On Kvatch, he will just reply: "Kvatch? You've seen it. Kvatch doesn't exist any more." After you have closed the Gate and cleared the path to the Chapel, Tierra and Savlian will have a brief conversation, while Berich will be pleasantly surprised: "I didn't expect any of us to live this long. Maybe we're not doomed, after all." During the Battle for Castle Kvatch, Berich will stay in the Chapel while Savlian and his men storm out the northern exit to clear the path to the bridge; when it becomes apparent that the bridge is shut down, Savlian will ask you to return to Berich for the key to the Guard House. When approached, Berich will say: "I'm just waiting for Captain Matius to give the order. Finally, a chance to fight back!" When asked for the Guard House Key, he will ask: "Yes, I have it. Why?" Two options are available to you, once again depending on your attitude. If you choose to refer to Savlian's orders, he will offer his help, although a bit insulted: "Hrmph. You do the guard one little favor, and suddenly you think you're Matius' best friend? You probably couldn't find it on your own. I'm coming with you. If we make it, I'll open the door for you. I've still got some fight left in me." If you choose the more friendly approach, saying "I need to get into the Castle", Berich will respond: "That's right! They managed to close the castle gates just before we were forced in here. I'm afraid you're in for a tough time, friend. The city's in bad shape, and it will be difficult to make it to the Guard House by yourself. I'd better go with you. We'll have to go through the Chapel Undercroft, and then through what's left of the city. If.... If I don't make it, take the key and carry on without me. You need to reach the tower at the north wall of the city." Regardless of your choice, Berich will then draw his sword and rush into the Chapel Undercroft and engage in combat against the residing Daedra. Once the area is cleared, he will head out the door and fight any Daedra blocking his way to the Castle Kvatch Passageway. If he survives he will wait for you near the passage and will, when approached, say: "This is it. The entrance to the passage is right here. I'll unlock it for you. Best of luck." He will then unlock the entrance with his key and stand guard until you enter. If you try and talk to him, he will say: "If Captain Matius is waiting on you to get that gate raised, you'd better get moving. I'm going to head back and meet up with the rest of the troops." After this, Berich will wait near the passageway and will not move until you raise the gate to the Castle. He will then assist you in clearing out the courtyard and the Castle Kvatch Great Hall until finally pausing when everything is under control; during the entire battle, his only remark will be: "Now's not the time for talking." When you are ordered to search for Ormellius Goldwine, Berich will stay behind along with Savlian Matius and Ilend Vonius; after the quest, Berich will stay in the Great Hall for the rest of the game. The Battle for Castle Kvatch: Try to save the Count of Kvatch, and rid the city of any remaining Daedra. This page was last modified on 25 March 2018, at 02:42.